I haven't written a '10 Things That Made Me Happy This Week' post in a while, but I thought I would change things up a bit and just tell you some of my favourite things. It might be from that particular week, it might be just in general, but it'll all be things that put a smile on my face. 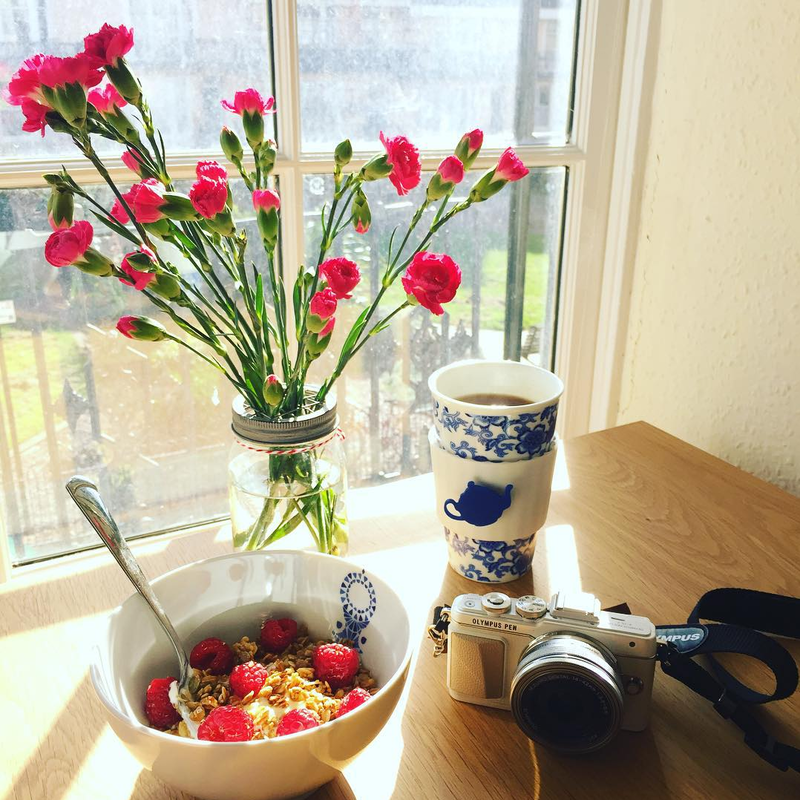 breakfast & blogging; the best. - Moving back to Brighton, settling into my flat. I love making a space my own, so really took the time to make my bedroom somewhere I was truly happy and comfortable in. I've moved back into the same flat I was in for 2nd year and I knew I didn't want to put everything back in the same place. I spend a lot of time in my room, with it being a student flat with no communal area apart from a teeny tiny kitchen. I'm currently sitting at my desk, my favourite Oliver Bonas candle flickering and letting off its sweet scent next to me, a bloom of pink flowers in a mason jar to my left, a photo of my man & I with a little silly love note he'd scribbled down once and I'd kept and tucked it into the white gold frame to my right and with Mumford & Sons album softly playing from my speakers. I feel very happy and calm. I have a huge blank canvas in front of me, as I plan to fill the wall above my desk with photos, quote, pictures, sayings to fill me with inspiration when I need it. - Pumpkin Spice Lattes. Late to the bandwagon on this one, but it's like drinking a cup of Autumn. Autumn tastes pretty darn good. - Great British Bake Off. obviously. - When you wake up up to sunshine pouring through your window. - Henry & I had his flat to ourselves last night. He cooked us risotto for dinner, we just had a completely chilled out evening, in pyjamas, watching (& getting very seriously hooked on) Doctor Foster. It was just really lovely to be doing nothing fancy and to have some time be just us two.